The ID. family is set to make e-cars affordable for millions of people. The first vehicles of this new generation of e-cars will make their debut in 2020. 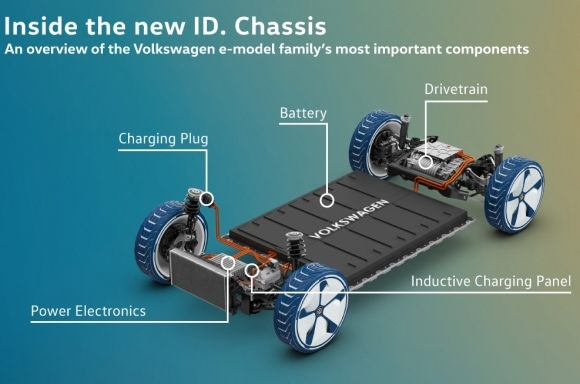 Wolfsburg (October 4, 2018) — Individual mobility is on the threshold of a new era: Electric drivetrains and digitalization are set to bring about the most fundamental change the car industry has ever seen. The sales volume of battery electric cars (BEVs) rose by 60 percent in the past year and 2018 could be the first year that newly registered electric cars reach the one-million mark—a target Volkswagen hopes to hit with the global ID. family by 2025. Globally, more than six million new Volkswagen vehicles roll out of production plants and onto the road each year. The brand’s scale helps make technical innovations affordable for the masses—and it will be no different for the electric vehicles in the new ID. family. Volkswagen's aim is to make electric cars attractive to as many people as possible, thus paving the way to mass electric mobility. With the I.D., the I.D. CROZZ, the I.D. BUZZ and the I.D. VIZZION, Volkswagen has already presented four concepts. The development of the vehicle technology is virtually complete, as are the designs of the various models. Contracts with the battery suppliers have been signed. Volkswagen is investing more than one billion euros to prepare its plant in Zwickau for the production of MEB vehicles. The company is also committing itself to developing a comprehensive charging infrastructure. In short: Volkswagen’s e-mobility offensive is taking shape on all fronts. The technological backbone of the ID. family is a newly developed vehicle platform: the modular electric drive matrix or MEB for short. Volkswagen is one of the most successful platform developers in the automotive industry. One example of this is the modular transverse matrix (MQB), probably the most successful vehicle architecture in use at present: around 55 million vehicles are being produced by the Group based on the first generation of MQB. Volkswagen is now applying this same platform strategy to the era of electric vehicles. 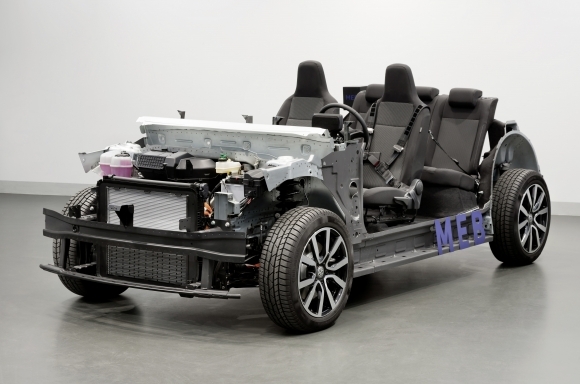 The MEB is not just the technical building block for all models in the Volkswagen ID. family, but for many electric cars produced by other Group brands, including Audi, SEAT, Škoda and Volkswagen Commercial Vehicles. The MEB has two major unique selling propositions. First, it is not a platform for vehicles with combustion engines that has been retroactively modified. Instead it is a modular assembly matrix designed specifically for pure electric cars, which enables Volkswagen to utilize this technology to maximum effect. Second, the vehicle concept and design can be structured in a more flexible way than ever before—the spectrum ranges from compact cars to SUVs and MPVs. This will enable the Group to achieve economies of scale, thereby making electric cars cheaper and more affordable for many people. The MEB—designed with purely electric drive systems in mind—enables the size of a vehicle’s wheelbase to be increased while reducing the body overhangs, resulting in more dynamic proportions. In addition to allowing the designers to create a standalone design DNA for the new zero-emissions vehicles, the chassis design leads to much larger and more versatile vehicle interiors. The zero-emissions drivetrain in the ID. family primarily consists of an electric motor integrated into the rear axle with power electronics and a transmission, a high-voltage flat battery pack installed in the vehicle floor to save space, and auxiliary powertrains integrated into the front end of the vehicle. The power electronics are effectively a link that controls the flow of high-voltage energy between the motor and the battery. The power electronics convert the direct current (DC) stored in the battery into alternating current (AC). Meanwhile, a DC/DC converter supplies the onboard electronics with 12-volt power. The single-speed gearbox transfers the power from the motor to the rear axle. The motor, power electronics and gearbox form a single, compact unit. The electric motor of the I.D. concept car showcased at the 2016 Paris Auto Show had a power output of 168 hp. The I.D. prototype can accelerate from 0 to 62 mph in less than eight seconds, with a top speed of 99 mph. Electric motors offering either more or less power may be considered for the 2020 series version. In parallel to this, the ID. family will feature a range of battery sizes. The battery’s modular layout allows scalable ranges from about 200 miles up to more than 340 miles on the WLTP (Worldwide Harmonized Light Vehicles Test Procedure) cycle. It is installed centrally in the underbody, which saves space, significantly lowers the center of gravity, and gives an optimal weight distribution of close to 50:50. The MEB architecture will also enable new assistance, comfort, infotainment, control and display systems to be integrated into vehicles across the board. The I.D. concept presented at the Paris Show, for example, featured an AR (augmented reality) head-up display which projects information such as visual cues from the navigation system into the virtual space in front of the vehicle. To control the huge range of features on board the ID. models, Volkswagen has designed the completely new end-to-end electronics architecture, called E3, as well as a new operating system, called vw.OS. The new E3 architecture consolidates the control units known across the industry today to create a much more powerful and centralized processor unit. The new operating system will allow Volkswagen to keep the vehicles fresh during their entire lifecycle by making the systems compatible for updates and upgrades accessed via the Cloud. An EV’s battery system must meet high expectations—and not solely in terms of achieving the best possible range. Drivers also expect that they will operate in all conditions and temperatures, and they want the charging time for the cells to be as short as possible. The batteries in the ID. family will meet all of these expectations. The largest automotive manufacturer in Germany is now applying its extensive experience from decades of development, production and scaling of engines and transmissions. This know-how has been used in the past few years for fully electric models (BEVs) and plug-in hybrid vehicles (PHEVs), including the e-up! and e-Golf BEVs and the Golf GTE, Passat GTE and Passat Variant GTE PHEVs. Each of these is equipped with high-voltage batteries that are reliable and extremely safe. These batteries are primarily produced at the Volkswagen component plant in Braunschweig. Volkswagen Components, the business unit responsible for the drive systems, is currently expanding the Braunschweig site to be able to build up to half a million battery systems per year in the future. In addition, a pilot line for battery cell production is currently being built in the Salzgitter factory. The Volkswagen Components business unit also produces the electric motors and I its plant in Kassel has been restructured for this purpose. All told, Volkswagen is investing 1.5 billion dollars in electric mobility at its sites in Braunschweig, Salzgitter and Kassel. The Volkswagen Components business unit has developed a completely new battery system for the Volkswagen ID. family that is both less complicated and significantly more powerful than previous systems. Unlike the batteries used up to now, the MEB system has the benefit of being scalable, which means it is relatively simple to integrate it in different performance levels into the ID. models. For example, if a prospective ID. owner is less interested in having a car that can travel great distances—because they primarily use it in the city and only travel short distances—they can opt for a battery with a lower energy yield. This makes the vehicle cheaper. Drivers who frequently drive longer distances would be more likely to opt for a larger battery. This gives the vehicle owner more flexibility. It is exactly this ability to customize performance that makes the new battery system so attractive. In addition to scalability, there are other advantages to the new battery system, including weight optimization (thanks to an aluminum housing), the adaptability of various cell types, and integrated cooling. The battery can be used to drive one or both axles. As the cell modules are arranged in a similar manner to a bar of chocolate, the batteries are also easy to install. Volkswagen has also been able to increase the charging capacity to up to 125 kW—a value so far not achieved by mass-market EVs, which will shorten the charging time. The battery housing includes integrated battery cooling, a connection box for the high-voltage and low-voltage electrical system (AC, DC and 12 V), and the newly developed MEB cell modules, which consist of individual battery cells. The cell controllers (CMCe)—control units to monitor the cells (voltage, currents and temperature) and cell balancing (ensuring the cells are uniformly used in day-to-day operation)—are integrated in the longitudinal beam of the battery housing. The battery electronics unit (BMCe) is integrated in the rear part of the battery system as a further control unit. Cell module connectors are used to link the cell modules to one another; measuring cables communicate with the battery electronics. The battery housing is closed at the top with a cover that is easy to remove in the event that maintenance is required. Either pouch or prismatic cell types can be used, resulting in high flexibility in collaboration with cell suppliers. Volkswagen created the Centre of Excellence for battery cells in 2017 to aid the development of lithium-ion batteries by providing detailed specifications on the product. In this way, the Centre of Excellence is responsible for all battery cells used by the Volkswagen Group. A lithium-ion battery cell consists of an anode (carbon, copper foil), a separator (porous polyolefin film, ceramic-coated), a cathode (lithium metal oxide, aluminum film) and an electrolyte (organic solvent, lithium conducting salt, additives). When charging, the lithium ions migrate from the cathode to the anode and are stored there. Electrical energy—supplied by the electrical grid—is then converted into chemical energy. The electrons flow through the electrical circuit, while the lithium ions flow through the separator. During the discharge process—to operate the electric motor—the lithium ions migrate back to the cathode. The chemical energy is then converted into electrical energy once more. In this case, the electrons flow through the electrical circuit and the lithium ions flow through the separator in the opposite direction. For Volkswagen, e-mobility is more than just a good e-car. All the relevant parameters must work together: the vehicle, the mobility services, and the infrastructure. The Volkswagen brand is building its own charging and energy ecosystem in the form of hardware and software for the vehicles' environment as a whole—at home, at work, in the public realm, and on the highway. As many activities as possible are bundled in-house in order to ensure the quality of all services. According to current surveys, most ID. drivers in Europe will only have to charge their car once a week, as the majority of commuters do not travel further than 30 miles per day. Based on analyses by Volkswagen, it is estimated that around 50 percent of all charging processes will take place at home and another 20 percent will take place at work. Volkswagen will thus offer a modular program of wall boxes which can be mounted in carports, garages or company parking lots. While a vehicle is charged at 2.3 kW via the standard 230 V grid, the wall box will allow the ID. 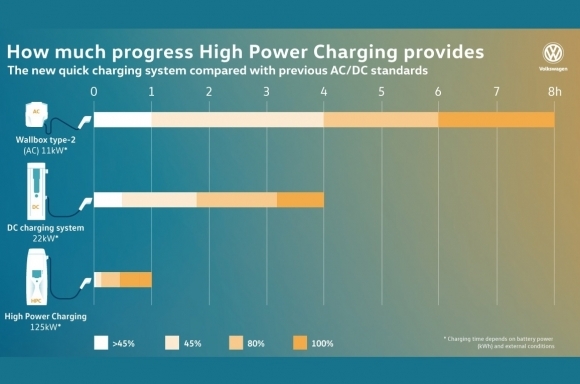 models to be charged at a rate of up to 11 kW (AC)—this charging capacity is sufficient to fully charge the Volkswagen's battery overnight (which is often cheaper) or during the working day. The starting price for the Volkswagen wall boxes will be about $350, plus installation costs. 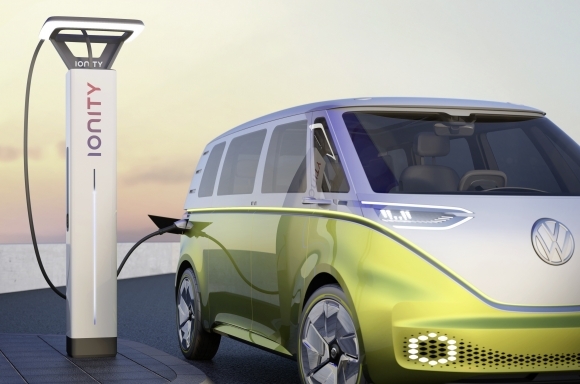 Volkswagen also plans to produce wall boxes that offer 22 kW (DC) charging capacity and work in a bidirectional manner, allowing energy to be supplied to the grid. At night, electric vehicles connected to the bidirectional wall boxes will serve as a storage battery for surplus capacity. A quarter of charging processes will take place at public quick-charge stations, while 5 percent will occur on highways—in both cases at a rate of more than 125 kW. It will be enough to charge once for a 340-mile stretch. If the ID. vehicle is charged at a quick-charging station with the aforementioned 125 kW rate, charging will be completed in about 30 minutes. Expansion of the charging infrastructure is of utmost importance. One step towards achieving this in Europe is the Ionity joint venture. 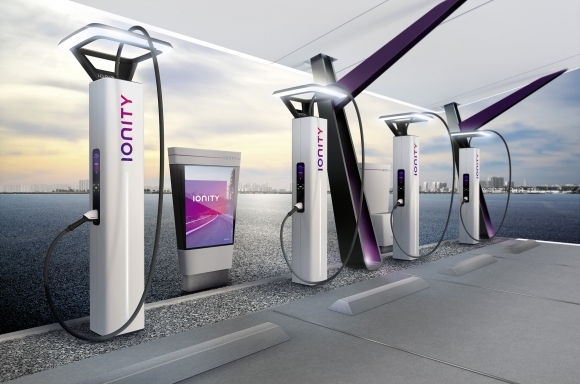 Through Ionity, Volkswagen is cooperating with the BMW Group, Daimler AG, and Ford Motor Company to create a reliable network of powerful quick-charging stations along European highways. A total of 400 quick-charging stations, dubbed the ‘filling stations of the future’, should enter into operation by 2020. The ID. models will be able to charge batteries at these charging points with at a rate of up to 125 kW. Overall, it is critical that the expansion of the charging infrastructure must be massively pushed in all countries. 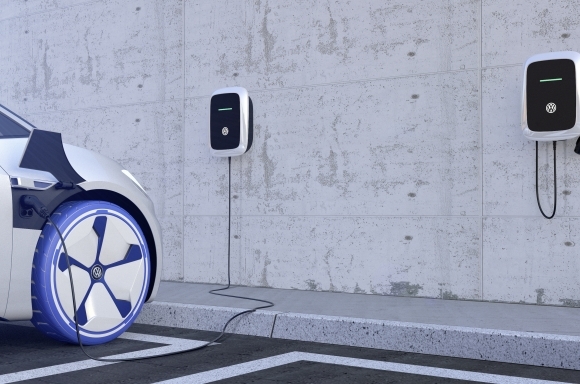 It goes without saying that Volkswagen is contributing to the expansion of the charging infrastructure: All 4,000 authorized Volkswagen dealers in Europe will be equipped with on-site charging stations. Volkswagen will also expand the network of charging stations at its production sites in employee parking lots from 1,000 to 5,000 by 2020, and provide regeneratively-generated power at the company charging points wherever possible. In the future, the Volkswagen “WE” mobility platform will offer the “We Charge” app-controlled service to answer owner questions about charging. “We Charge” will ease range anxiety by showing the most suitable charging point, reserving it, and navigating to it. 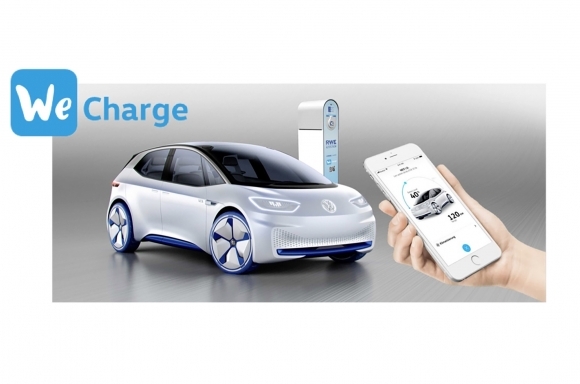 The “We Charge” functionality is currently planned for the European market, and will be facilitated through Volkswagen's shareholding in Hubject – eRoaming. The platform makes it possible to charge electric vehicles throughout Europe no matter who the provider is, and utilizes 300 partners and 55,000 charging points. Payments are currently made via RFID or smartphone app with a QR code. In the not-too-distant future, the system will be revolutionized with “Plug & Charge”, which uses block-chain technology to facilitate billing and payment for the charging process directly via the ID. model itself. The future of e-mobility provides several other smart solutions. Integrated into the home power network, zero-emissions vehicles will stabilize the power grid by storing surplus capacity in the power network, which frequently accrue at night and so far remain unused. Volkswagen wants to go one step further than simply providing wall boxes: The company is also planning to design a digitally linked home energy management system (HEMS), which can be used to reduce energy costs for households and mobility alike. The HEMS manages the energy demand of the e-car and the house heating pump while incorporating photovoltaics and household batteries. In the evening, the user will enter the range they require for the following day and at what time. The ID. vehicle communicates with the HEMS and establishes the best charging cycle on the basis of the current electricity price and availability. In the event of a power outage, the HEMS can, fall back on the available residual energy of the ID. vehicle to temporarily power the home. Even with the anticipated increase in the number of registered electric vehicles, the available power grid will be sufficient. Take Germany as an example: one million electric vehicles would consume approximately 2.4 TWh (2,400,000,000 kWh) of power per year. Annual energy consumption in Germany is 517 TWh. Thus energy consumption will only rise by 0.5 percent due to the use of electric cars. This press release and images of the ID. concepts are available at media.vw.com. Follow us @VWNews.